These are luer slip syringes without needles that are excellent for administering measured amounts of Parvaid, Kitty Distempaid, CS, tinctures, etc. Reinforced tip, large finger grips, smooth draw, easy-to-read graduations, latex free, sterile, non-toxic, and pyrogen free. Rubber plunger with double contact for a positive seal and effortless injection. FDA approved and autoclavable. If purchasing for use with Parvaid or Kitty Distempaid, syringe size needed is based on the weight of the puppy or kitten. We suggest two syringes, one for oral doses and one for enema doses (if not being given Sub Q fluids or on IV's, enemas are or may be necessary to prevent dehydration). Make sure to mark the enema syringe clearly, as you never want to accidentally use an enema syringe for an oral dose, even after it's been washed, as you can reinfect a puppy with parvo or a kitten with distemper. Animals weighing 0 to 3 pounds need 5 or 6 ml syringes. Animals weighing 3 to 10 pounds need 12 ml syringes. Animals weighing 11-20 pounds need 20 ml syringes. Animals weighing 21 to 50 pounds need 60 ml syringes. 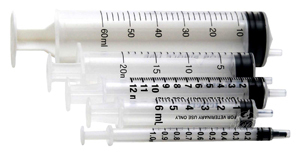 These syringe sizes are based on using with Parvaid or Kitty Distempaid and electrolyte fluid. 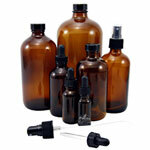 Syringes are often needed to administer the following products. Parvaid is recommended for parvo, distemper, e-coli, giardia, corona, vomiting, diarrhea and in combination with the "Coccidia" remedy for puppies with coccidia.